It's highly likely that most of us came into contact with the surreal world of Jan Švankmajer courtesy of Channel 4 and the Keith Griffiths documentary The Cabinet of Jan Švankmajer: Prague's Alchemist of Film that was screened as part of its late night Visions series in 1984. Ah, the good old days of Channel 4 when Czech surrealism rubbed shoulders with Brookside and The Tube. As Michael Brooke explains in his Screenonline notes about the documentary: "Though prior familiarity with Švankmajer's work helps, even a complete newcomer (which would have described most of the original audience) will be able to glean that he's based in Prague, that he's fascinated by the era of the sixteenth-century Bohemian emperor Rudolf II, especially his court painter Giuseppe Arcimboldo (creator of portraits of human faces made up of fruit, vegetables, fish and other assorted objects), and that he has a peculiar addiction both to the hidden power of inanimate objects in general and, more specifically, their texture and feel." Jan Švankmajer, born in Prague in 1934, is one of cinema's greatest surrealist poets and now his first full-length film, Alice, arrives on the blu-ray high-definition format this month courtesy of the BFI. By the time he made Alice in 1988, he had already carved out a significant career as an artist, writer, animator and film maker. Švankmajer's arrival into the world coincided with the formation of the Surrealist Group of Czechoslovakia, one that included writers Vítězlav Nezval, Karel Teige and Jindřich Heisler, poet Konstantin Biebl, director Jindřich Honzl, composer Jaroslav Ježek, painters Jindřich Štyrský and Marie Čermínová, sculptor Vincenc Makovský and the psychologist Bohuslav Brouk. His own career is both intertwined with the legacy of their surrealist manifesto and the development of the movement and with the censorship of their work at the hands of Stalin and Hitler. By the time of Hitler's occupation of Czechoslovakia, Stalin had already attempted to dissolve the group and with the advent of the 1947 International Surrealism exhibition in Prague many of the group had either sworn their allegiance to Communism or fled to Paris. When Švankmajer studied at the Prague Academy of Performing Arts in the 1950s, he became immersed in Soviet avant garde film and theatre, his interest in surrealism having been triggered by Salvador Dali, Max Ernst, Luis Buñuel, and Joan Miró and a book by Teige, who by 1948, as one of the few members of the Surrealist Group that remained in the country, had been condemned as a degenerate Trotskyite. Following his early work within the theatre, using puppets and live action, Švankmajer contributed to Emil Radok's film version of Faust in 1958, meeting several future collaborators while working on the production. After a period of work in theatre, performance, drawing and writing, he made his first film, The Last Trick in 1964 and, even though he did not really consider himself part of it, his earliest films were made contemporaneous to the 'Czech New Wave', a period of cultural revival in Czech theatre and film that saw the emergence of directors like Miloš Forman and Ivan Passer and writers such as Václav Havel and Milan Kundera. When Russian tanks rolled into Czechoslovakia in 1968, Švankmajer continued to make films but he, as did many of his contemporaries, fell foul of hard line Communist rule that rejected the more open society promised by Dubček's 'Prague Spring'. It became increasingly difficult for him to get films made and although his output continued between 1964 and 1973, the Czech authorities saw his work as antithetical to their propagandist requirements and he was subsequently banned from making films from 1974 onwards. He returned to puppets and theatre, where he had started out, and to more writing and painting. He further rankled the Communists when his 12 minute short Dimensions of Dialogue, made by stealth in 1982, won the Golden Bear at the Berlin Film Festival. 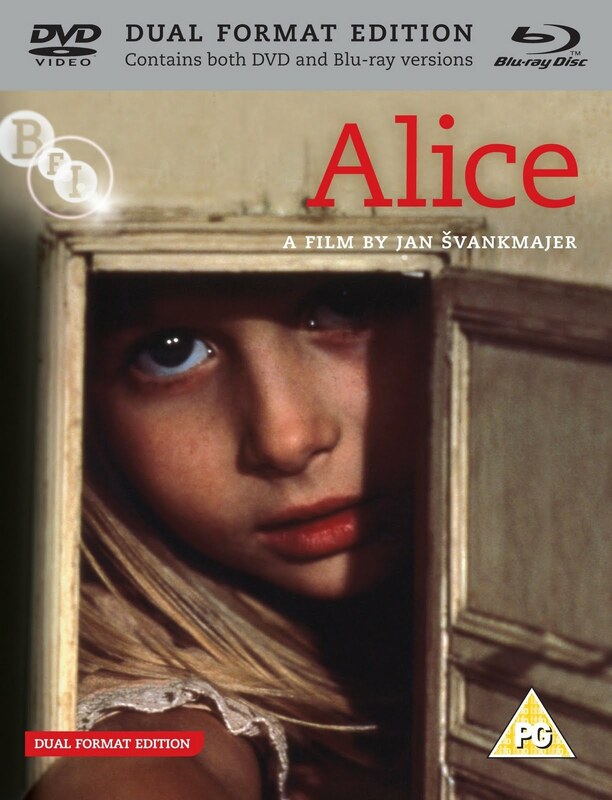 Banned from making films for another three years, Švankmajer managed to make Alice via co-production with Channel 4 and German television and exploited a financing loophole with a Czech authorised exhibition company to secure the production. 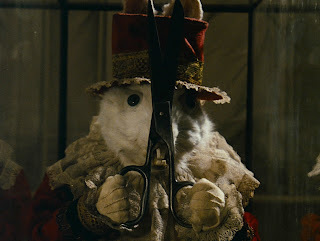 The film was nursed into existence by dedicated Švankmajer supporters Michael Havas and Keith Griffiths, the director of The Cabinet of Jan Švankmajer which had been screened on Channel 4 and had impressed Jeremy Isaacs enough for him to stump up nearly half of the budget. Griffiths recounts in Forbidden Animation that someone at the exhibition company tipped the authorities off and this resulted in a standoff between Czech officials and the director, and "despite being somewhat annoyed that Alice had not been produced through normal channels they recognised the changing economic climate of Eastern Europe. They swallowed hard and accepted the valuable foreign currency and more positively they helped promote the film at the Berlin Film Festival." 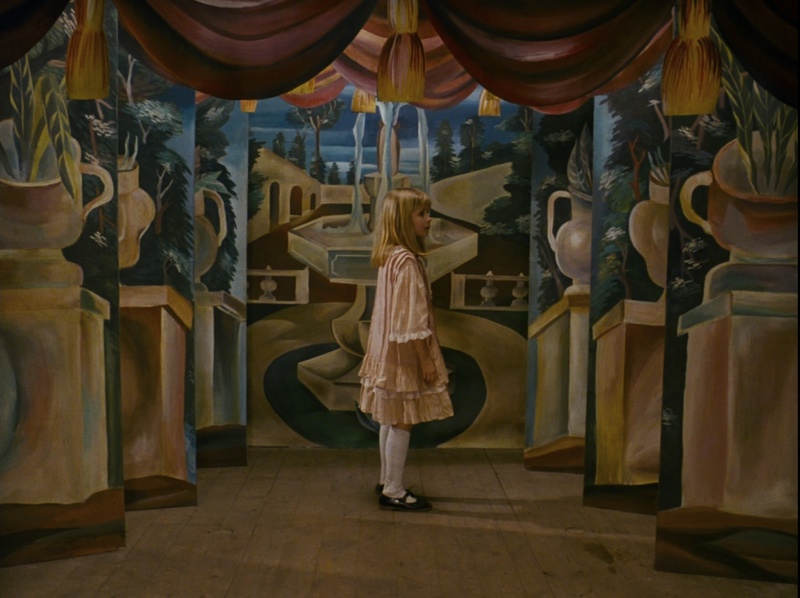 Alice is a loose adaptation of Lewis Carroll's Alice in Wonderland and yet it seems to be the perfect material for a Švankmajer film with Carroll's own surrealism underpinning the dark, uncanny and Gothic tinged version seen here. Švankmajer had previously adapted Carroll's poem Jabberwocky from the book in 1971 and Alice was a further acknowledgement of the inspired dream logic of Carroll's vision. His version of the story is not the cheery animation of Disney and nor is it the psychedelic black and white vision of Jonathan Miller's BBC adaptation of 1966. It mixes the absurdities of Carroll and his own predilection for, what Clare Kitson describes as in her excellent notes that accompany this release, the Mannerist artworks commissioned by 16th Century Prague's emperor Rudolph II and an enthusiasm for collecting as symbolised in his 'cabinets of curiosities' that housed an amalgam of man made and animal, mineral and vegetable hybrids (best emphasised in the film with Alice's descent into the world of the White Rabbit as shelves and shelves of objects and jars pass before her eyes). The bestiary as depicted by Rudolph's court painter Arcimboldo and the obsession with a catalogue of strange objects powerfully informs Alice as much as it does other Švankmajer films. These objects - a white rabbit stuffed with sawdust in a glass case, a caterpillar made of socks, the skeletal courtesans - fuse with recognisable characters from the Carroll original. 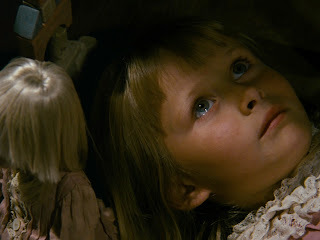 The central character of Alice is represented in both human form (by Kristýna Kohoutová) and doll form as she alternatively shrinks and grows. 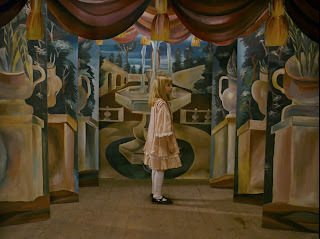 We follow her journey from naturalism, in the opening scene of her sitting by the river, into nightmare through a complex series of portals and doorways that lead to a dream world where objects become animated and represent both her own subconscious fears and the political context in which Švankmajer made the film. He indicates his business right from the offset by having Alice announce directly to the audience that "now you will see a film made for children…perhaps." Clearly it is not a film for young children because there are too many disturbing images here, often of a very real, tactile, lubricious and febrile nature. It is definitely the stuff of fetishistic nightmare rather than the product of a sanitised, colour saturated Disney cartoon. "... a disquieting atmosphere at once threatening and comical"
She entreats us to close our eyes because if we don't enter the dreaming state we won't see the magic that is about to come alive. 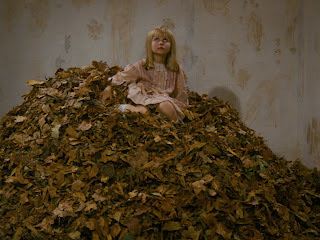 This is a film about communication on many levels - verbal, visual and subconscious - and as Michael Richardson claims in Surrealism and Cinema, "meaning is rarely conveyed by means of dialogue and many of Švankmajer's films are without dialogue at all … in Alice hardly anyone ever responds to little spoken discourse there is." 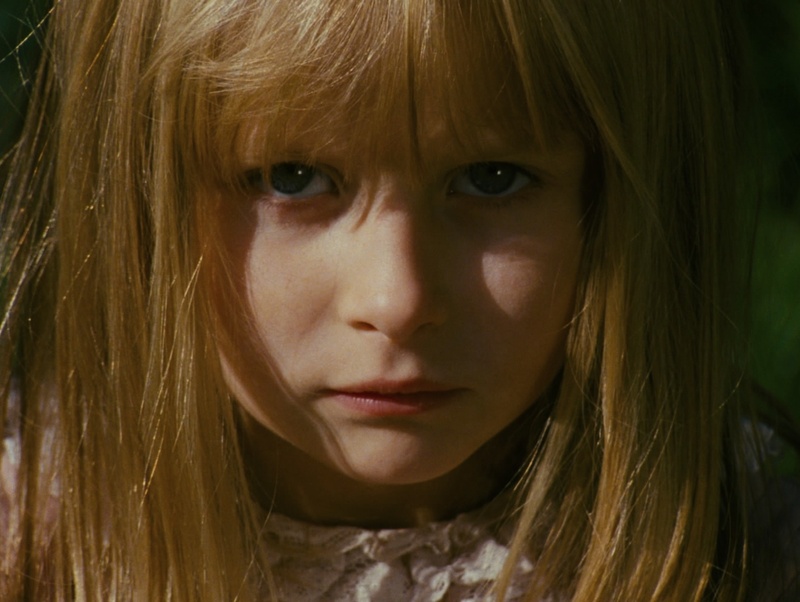 Alice breaks into the film with her repetitive sections of dialogue but they are not acted in the true sense of the word as this is a very physically performed and realised film. The dramatic action is centred on what is essentially a chase after an animated, stuffed White Rabbit and through a series of rooms which provoke very physical actions of squeezing, pushing, pulling, crawling and swimming to access them. A recurring motif is how she enters into spaces through desks and their drawers where, at the beginning of the film, she squeezes herself into a desk drawer in order to chase after the rabbit. As these animated creatures escape through a succession of doorways and desk drawers, Alice either requires a key to open them or, after repeatedly pulling off the knobs of the desk drawers, must use all manner of implements to force these open. As she embarks on this voyage, the world around her springs into life, growth seemingly born out of inanimate matter or a chaotic fusion of objects and substances. As Richardson observes, "the effect is to create a disquieting atmosphere at once threatening and comical… containing so many of our deepest fears that nothing could be more 'real' to us." This is a world of dead matter come back to life, of human girls transformed into dolls, of rabbits with fixed stares spoon feeding gnashing jaws with bowls of sawdust, of lumps of meat slithering over the furniture, of dead birds neighing like horses. This underworld is a series of dirty, empty rooms, and briefly we see them as spaces within what looks like a tenement building when Alice looks out of the window, far and away from the psychedelic Victoriana of Carroll. 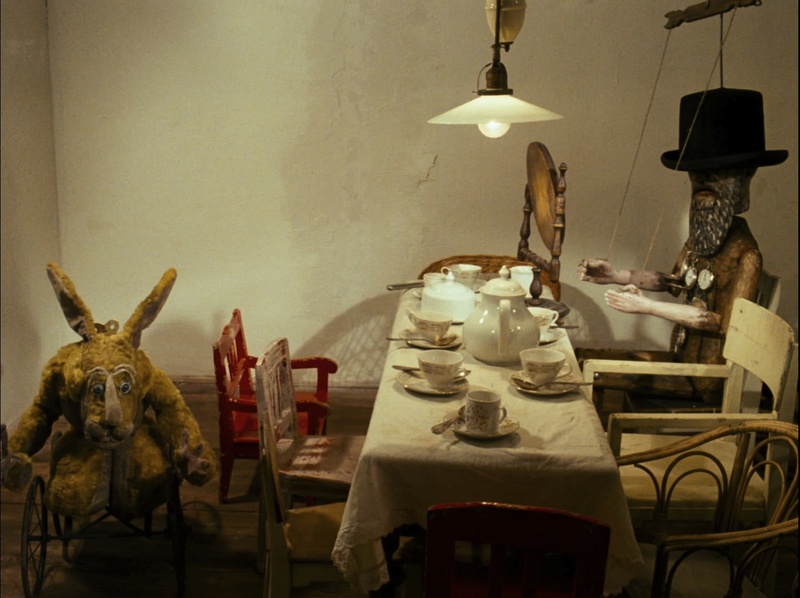 These visions are perhaps a commentary on Švankmajer's uneasy life in the Czech Republic, living in a deserted chateau where Alice was actually filmed, hiding out there from political pressure, a refugee from the absurdist games that his Communist detractors forced him to play. This is best seen in the tea party scene, wherein Švankmajer uses the Mad Hatter and the March Hare as symbols of political irrationality, constantly cycling through, and repeating, their dictats. The White Rabbit himself springs from the Mad Hatter's own hat during this sequence, a magically animated dead creature the offspring of another, one ideology creating the other. 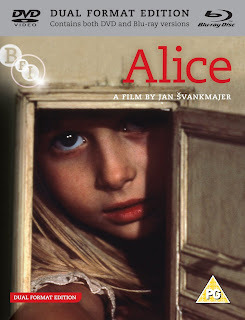 It is a somewhat episodic film, almost a series of short animations strung together, but it features some startling imagery as Alice wanders from room to room. In one she meets the Caterpillar, one of many stuffed socks that chew through the floorboards and dive from hole to hole all around her and in another she finds a tiny house in which a baby is constantly crying and crockery flies out of the door. 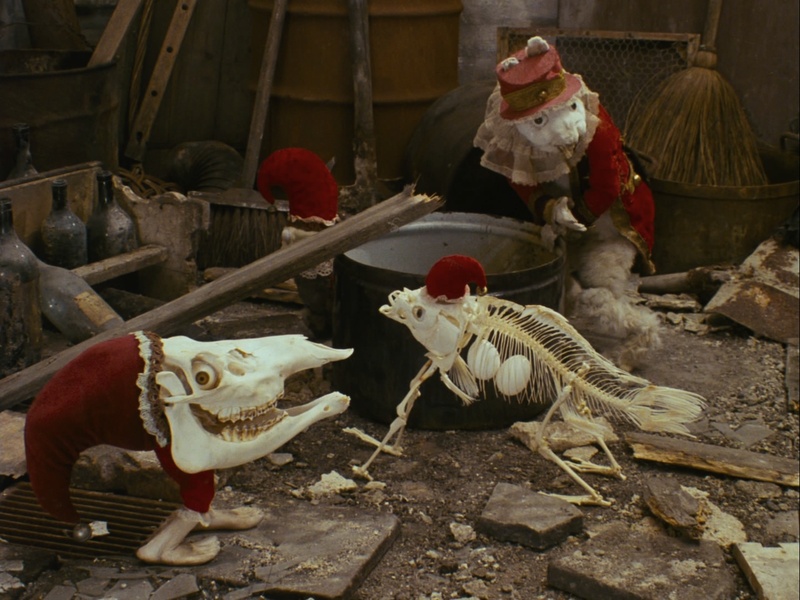 Carroll's own narrative serves Švankmajer well in this respect because the original book is a series of loosely related theatrical and non-linear moments. If you're looking for dramatic cohesion then this isn't the place to find it. However, if you're interested in a surrealism that explores the nature of a child's subconscious through a bricolage of imagery and symbolic meaning or a political allegory animated in a chateau in Prague that offers a Kafkaesque deconstruction of the city's Bohemian past then this striking and haunting film is highly recommended. Beautifully restored by the BFI, this transfer brims with fine detail in a clean and blemish free image. It captures the intricate construction of the stop-motion puppets exquisitely, provides a natural and vibrant colour palette and renders the dilapidated settings, the rich Archimboldian cornucopia of collected objects, toys and props within a very satisfying presentation. 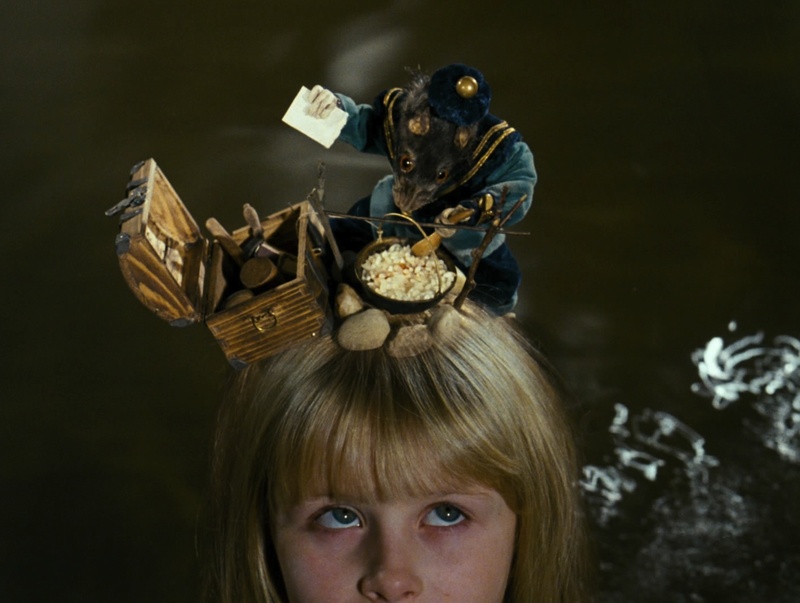 Sound is a hugely important element in Švankmajer's films. Here intense sound effects accompany the rich imagery to emphasise the dream-like nature of the film and the mono audio track more than copes with the expressive quality of these effects, never distorted or harshly reproduced. It's also available in its original Czech version, with English subtitles, for the first time. Illustrated booklet with a superb essay from Clare Kitson, detailed biographies of Švankmajer and Griffiths by Michael Brooke, fascinating notes on the extras, again from Brooke, plus a review from Philip Strick, an interview with Švankmajer and extensive credits.